Many of the substances incorporated into 19th and early 20th century living were not far from the state they were found in the natural world. Their chemistry was elemental and simplistic, a far cry from the multitude of complex laboratory-derived compounds that are listed on container labels today. Since the 1700's, limestone deposits along coastal Knox county have been quarried and then refined into lime to become the setting agent for cement mortars and plaster. The industry reached its hey-day in the 1880's, supporting a large fleet of schooners that moved lime by the barrel and supplied the limekilns with firewood by the cord. 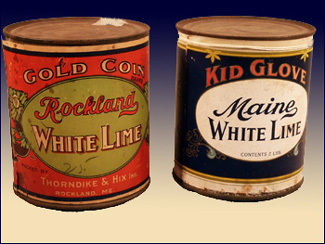 These small cans were possibly for mixing whitewash; they are still originally sealed. 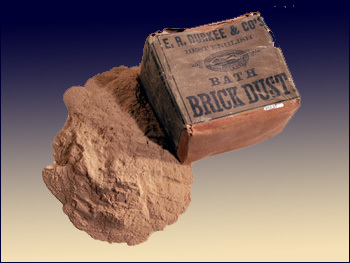 Brick dust was used as a polishing abrasive in 19th century households; our pre-ground packets are a step up from having to rub two soft 'Bath [England] bricks' together yourself, as instructed in an 1881 domestic arts encyclopedia. It would have worked as well on a ship's bell as on silverware, and was also used as a very fine honing agent for sharpening. Six Bath bricks are listed on an 1874 inventory of stores (just below 4 lbs. of brimstone) to outfit an American whaler; they are distinguished from a half dozen Bristol bricks (another polishing agent), and 200 (regular) bricks. By 1910, convenience had given birth to the ancestors of today's cornucopia of enticingly packaged scouring aids. 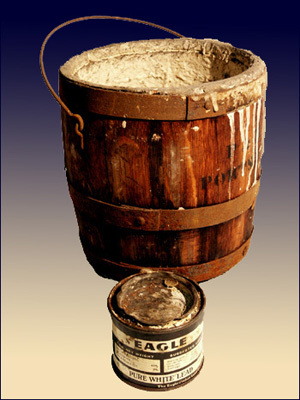 From the Clean-All label (above): "For Tinware it is very fine, And will make your marble shine, It positively contains no acid or grit, The name of this paste you must not forget." 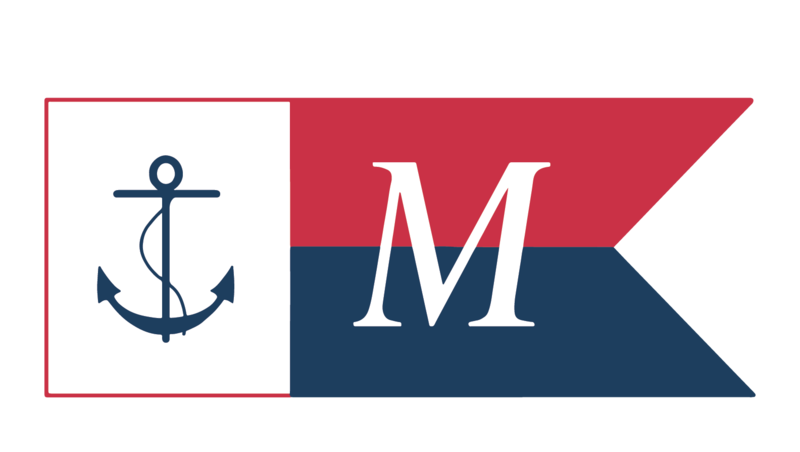 Paint was site-made as needed far longer than it has been available over the counter; schooner-sized quantities were made in our own Percy & Small shipyard Paint and Treenail building. 'White lead' came to mean a blend of lead carbonate and linseed oil that could serve as a putty, sealant, primer or paint depending on its thickness. 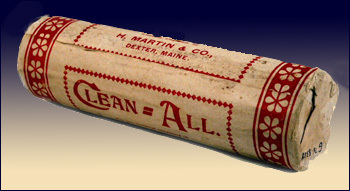 This little oak cask (above) of white lead was made by a Portsmouth, N.H. firm, and has been tidily dated by a torn newspaper page wrapped around the handle that lists an 1880 Kittery to Portsmouth timetable of the local steamer Mystic. By ca. 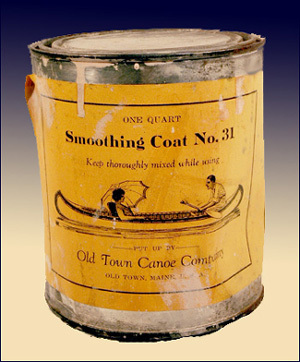 1900, white lead was getting a make-over as pre-mixed products began to appear, appealing to consumers preferring to spend idle hours floating, instead of coating, their canoes. 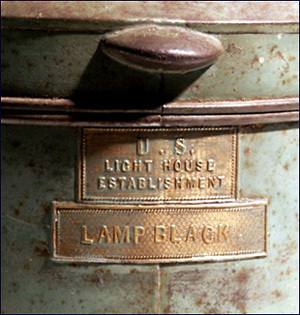 Unlike all my other specimens, this official U.S. Lighthouse Establishment lampblack container is empty of substance. 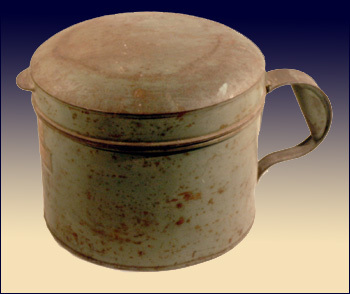 Soot that accumulated on the oil lamp chimneys of a lighthouse's lantern was cleaned off assiduously, but the black carbon powder kept in this tin was for blending with linseed oil, turpentine, and coachmaker's varnish to make black paint. Recipes and applications for various coatings are very explicitly outlined in the Instructions To Light-Keeper's, July 1881: black was for the outside iron of the lanterns and gallery railings, and for internal iron staircases, railings and general ironwork, "except pedestals and service tables." 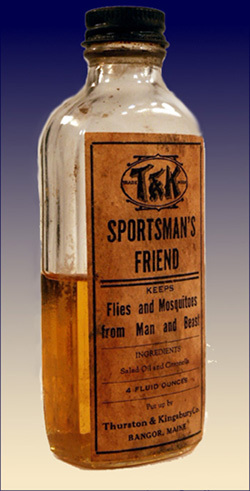 Insect repellent ingredients these days usually involve lengthy molecules and patent attorneys, but the blend of salad oil and citronella in this bottle of Sportsman's Friend is pretty basic, and might even seem edible after a few weeks in camp. It still smells like the great outdoors. 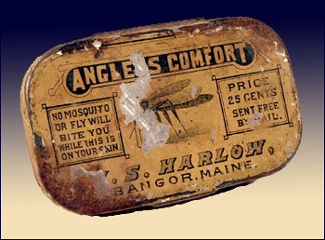 The wax-based Angler's Comfort in the tin above has lost any hint of its chemistry, but was judged edible by mice if toothmarks are an indicator. It has been endorsed on the back by "E. M. Stilwell, Commissioner of Fisheries, Etc. For State of Maine," who gave it "a thorough trial", which likely meant lots of fly-fishing. Prized above almost all other earthly delights by the laboring people of the world, tobacco's teasing hold on the mariner far from land has filled many a letter home. 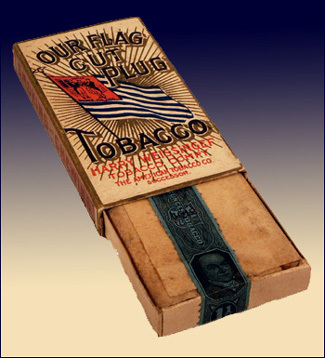 We have numerous empty tobacco containers, but this package of plug has unbroken seals around the contents, dated 1910. Chemical substance abuse reaches deep into the collection in my morgue of preserves. I dare not show you the mayonnaise, but will risk these pickles, or what used to be pickles. 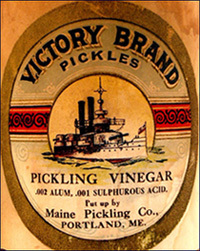 The image of what most certainly is the battleship Maine endows these Victory Brand pickles with an expiration date of circa 1898. It is, in many ways, a graphically modern packaging, complete with preservative listings and a separate neck banner, but the language still has a Down East tang: "Specially Prepared for Family Use" and "Put up by Maine Pickling Co."